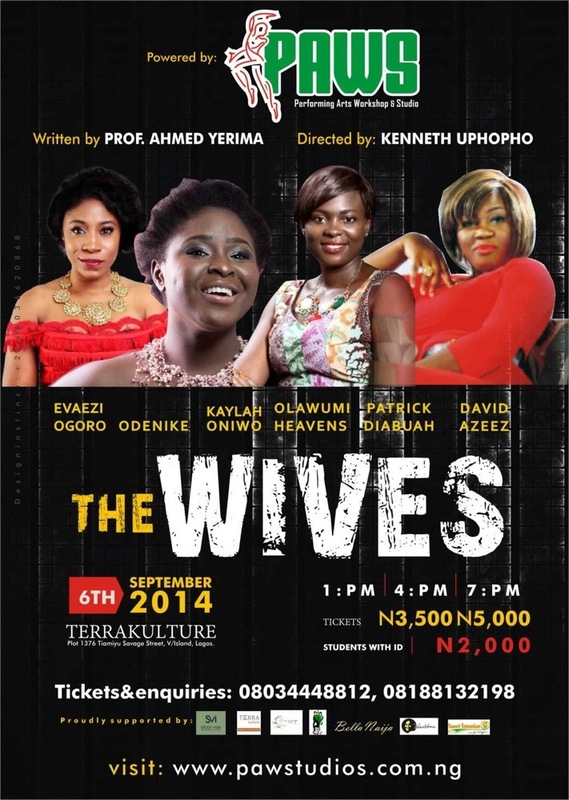 PAWSTUDIOS, producers of the BRITISH COUNCIL Lagos Theatre Festival 2014invites you to a stage play titled The Wives written by Professor Ahmed Yerima and directed by Kenneth Uphopho. Venue: TerraKulture, Plot 1376 Tiamiyu Savage Street, V/Island, Lagos. Time: 1pm, 4pm & 7pm. Our star studded array of Actors include Cool FM OAP Kayla Oniwo, Songstress EVAEZI, Red Carpet Xtra Oola Heavens and Odenike from Ojos in tha House. The story is about Chief Theophilous Gbadegeshin and his three Wives and Sister. PAWSTUDIOS the production company responsible for the show have been in the business of staging plays for over 10 years .